Description: Durga Puja (Bengali: দুর্গা পূজা, ?Worship of Durga? 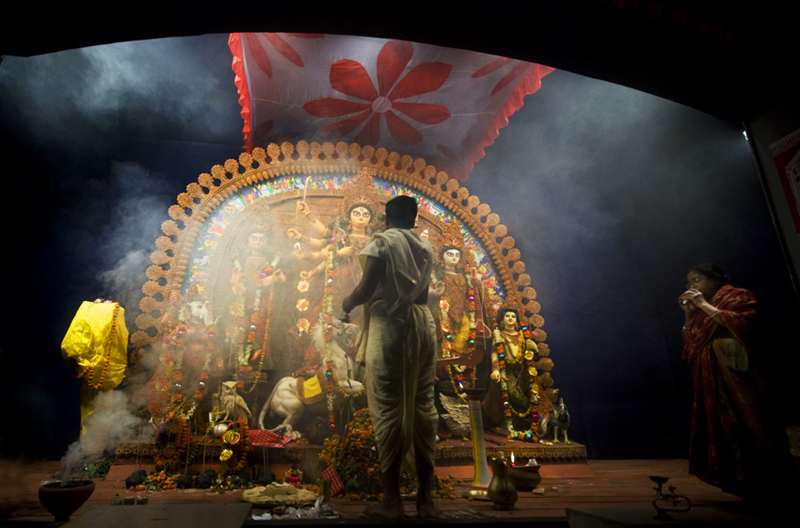 ), also referred as Durgotsab (দুর্গোৎসব, ?Festival of Durga?) is an annual Bengali festival that celebrates worship of Hindu goddess Durga. It refers to all the six days observed as Mahalaya, Shashthi , Maha Saptami, Maha Ashtami, Maha Nabami and Bijoya Dashami. The pujas are held over a ten-day period, which is traditionally viewed as the coming of the married daughter, Durga, to her father, Himalaya's home. It is the most important festival in Bengal, and Bengalis celebrate with new clothes and other gifts, which are worn on the evenings when the family goes out to see the 'pandals' (temporary structures set up to venerate the goddess). Although it is a Hindu festival, religion takes a back seat on these five days: Durga Puja in Bengal is a carnival, where people from all backgrounds, regardless of their religious beliefs, participate and enjoy themselves to the hilt. Here, the priest is offering "Aarati" to Devi Durga. love this shot , the light, the subject, colours , and atmosphere .